Besides changing the font and color of cells, you can also distinguish them by using cell borders. In order to add borders, go to HOME >> Font >> Borders. When you expand the Borders button, you can find many different options, such as Outside Borders, Thick Borders, All Borders, etc. 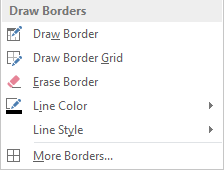 Below this list, you can find options to draw and erase borders or set line color and style. 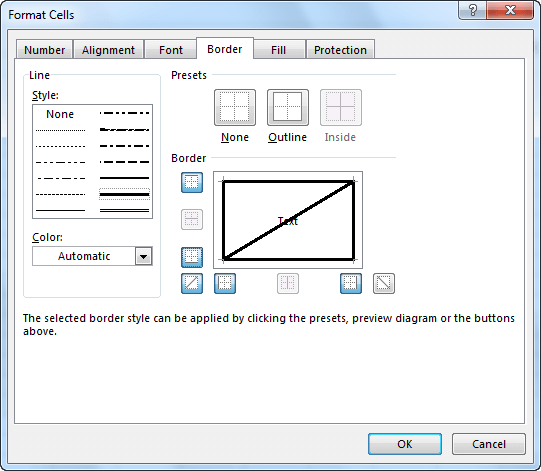 If you want to draw a border manually, click the Draw Border button and select the cells that you want to have borders. To create a border grid, select the Draw Border Grid button. If you want to erase borders, use the Erase Border button, then choose the cells from which you want to remove them. 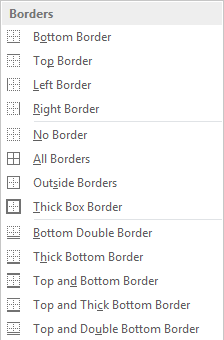 If you need more options, select the More Borders… button. A new window will appear. Here, you can change the border type, border color and select the edge of the cells to which you want to apply your border. Besides borders, you can also use a diagonal strikethrough from top-left to bottom-right and from bottom-left to top-right.